All of our local wild Turkey Vultures apparently lost their sense of humor over the snow last Monday. On Tuesday, they left our area for the winter. They will be in Mexico or Central America until spring arrives. Unfortunately, the adults leave first and their youngsters follow after a few days. I am not sure why that is, but it happens every year and it seems to work for the species, so who and I to judge their behavior. I do know that the youngsters look pretty darn lost as they hang out in the trees over the swan compound after the adults have left. REGI staff takes pity on the poor tykes and leave plenty of left overs for them to munch on to sooth their nerves. In a few short weeks the same Turkey Vultures that graced the area around the REGI facility will be enjoying South American. They have a migration route of approximately 3700 miles! They will return here in April. We have one special wild vulture that has a mate attachment to one of our foster mom vultures. He is the first to come back in the spring time and the last to leave in the fall. When I think of all the things he has seen and experienced in the months since they have seen each other it boggles my mind. 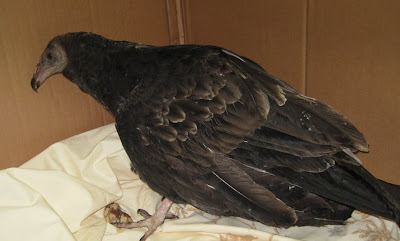 We have a new Turkey Vulture patient. What makes this one a little different is the vulture is a young bird and he has quite a story that came with him. The Zimmerman family found the young bird, or perhaps it is more correct to say the young vulture found them. The youngster was on porch of their home on Tuesday. If the vultures in Stevens Point area followed the same pattern as the birds in Antigo, the adults would have left early in the day on Tuesday, leaving the youngster behind. The young bird had a broken left wing that has healed before he was brought into rehabilitation. The fracture was a serious one when it happened. They youngsters parents would have cared for him not only feeding him but protecting him from predators during the healing process. In the end they had no choice but to leave him as their migration became necessary. 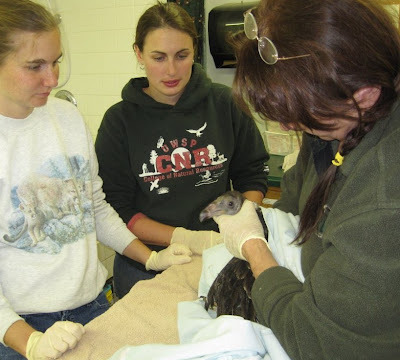 We were able to put the young vulture with our adult foster parent birds. The resident birds are non -releasable due to old injuries and will spend the winter with us here at REGI. The young vulture was delighted to see them and quickly fit into the group. His injury has healed and likely he will not be able to be released to the wild due to the severity of that fracture. 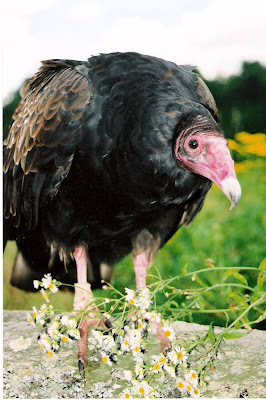 However there are many options for non releasable turkey vultures in educational facilities around the country. The important thing for now is he is safe, well fed and happy to be back with his own species. We are happy Steve and Evie Fisher are such good sports. 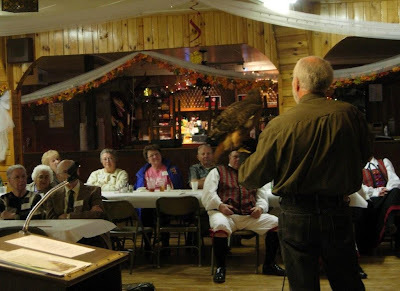 This weekend was a little over the top even for our good natured and seasoned educators including the educational birds. They had programs all weekend long but never complained once! We feel lucky to enjoy the wonderful people we get to meet thought our raptor programs. It is kind of the chicken or the egg scenario. 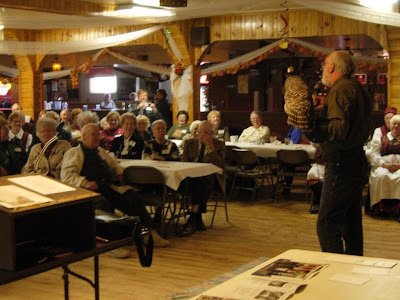 We wonder is it only terrific people that invite us or that are interested in wildlife? HUMM. Thanks to Steve and Evie.